Koss MV1 review | What Hi-Fi? 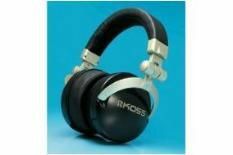 The gold plastic on these Koss headphones makes them look tacky and much cheaper than they really are. The vinyl cushion is designed to form a seal around your ears to block out ambient noise and leakage from the drivers, but the MV1s are not hugely comfortable and make your ears hot. When it comes to sound, there's impressive depth and weight to bass, but it's a bit slow, and treble and upper midrange is ill-defined and a touch fuzzy – and no amount of bass can make up for that.